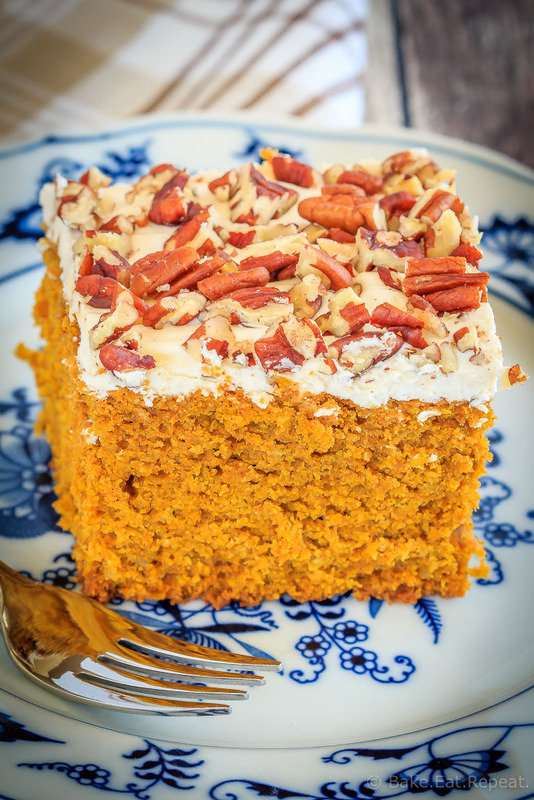 This pumpkin snack cake with cream cheese frosting is the perfect easy dessert or afternoon snack – an easy to make, sweet treat for the fall! I don’t actually make a lot of cake around here. Birthdays, of course, but that’s really about it. I’m not sure why, because we do enjoy our dessert, but I guess I lean towards brownies or cookies when I decide we need a sweet treat for after dinner or for a mid-afternoon pick me up! But….just because I’m not a huge cake or cupcake fan, does not mean the rest of the family agrees. They all really love having cake for dessert every now and then. Especially when it involves cream cheese frosting. If I’m totally honest though, this cake started with oatmeal in it and chocolate chips, with no frosting. Basically it was a muffin masquerading as cake. My family didn’t fall for that though – they knew it wasn’t really cake, so it was made again. I tried oat flour instead of rolled oats the second time because clearly they wouldn’t notice that. Um…..they did. Still not totally happy with this “cake” that I was giving them. So I made it a third time. This time it was met with approval – maybe because I stopped trying to make it a little bit healthier and just made a pumpkin snack cake? Possibly. 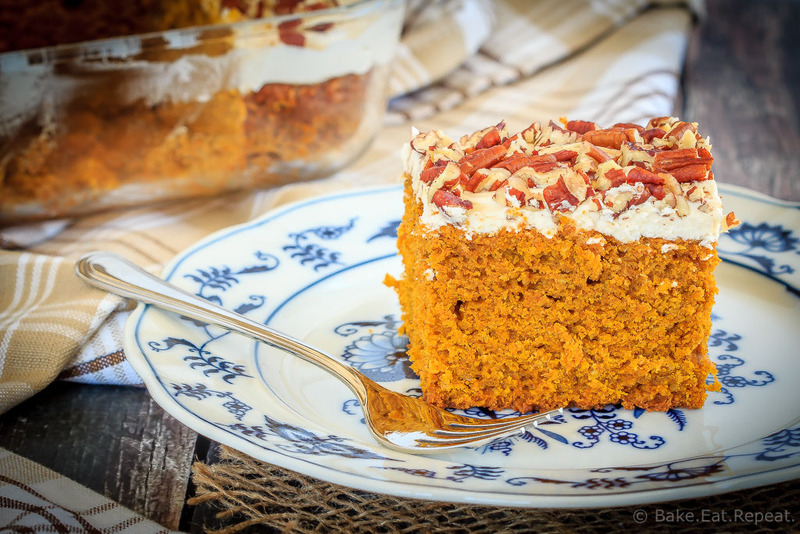 This pumpkin snack cake is super fast and easy to make – two bowls and a spoon is all you’ll need to mix this up and it will be in the oven in ten minutes. 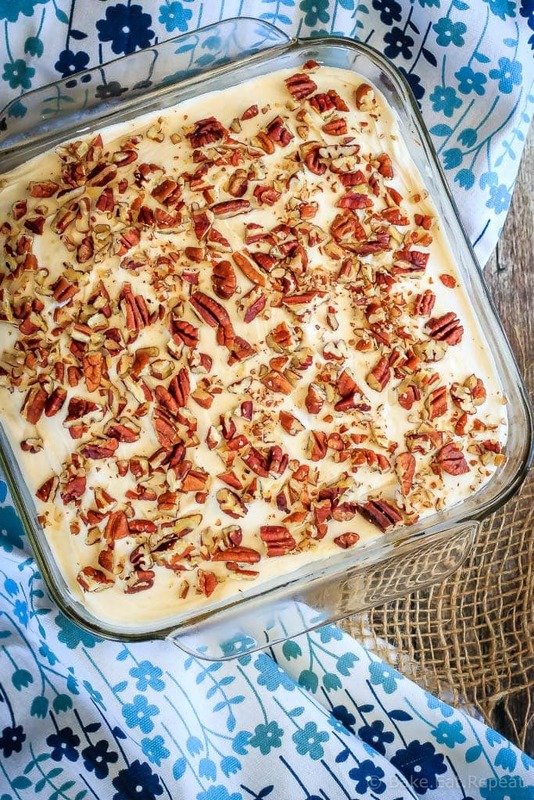 Pumpkin snack cake with cream cheese frosting – a super easy dessert that actually IS a dessert. Not breakfast pretending to be dessert. Clearly I need to make cake more often – it probably wouldn’t take quite so many tries to get it right then! the amount of cream cheese frosting listed in the recipe is slightly more then the amount shown in the photos (my husband informed me there wasn’t enough!) – however if you are like me and don’t like as much frosting, use 2 oz cream cheese, 4 tbsp butter, 1 tsp vanilla and 1 ¼ cups powdered sugar. 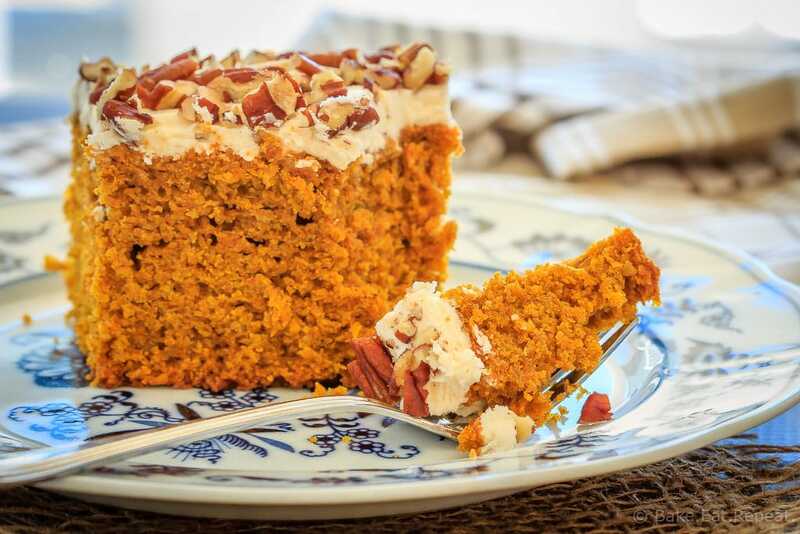 I’ve also share this Pumpkin Snack Cake recipe over on Food Fanatic.